Chamomilla Ext. Q: Ringing in ears. Earache, with soreness; swelling, Stitching pain. Ears feel stopped. Calendula Ext. Q: Deafness, worse in Damp surroundings and with eczematous conditions. Belladonna Q: Tearing pain in middle and external ear. Humming noises. Throbbing and beating pain deep in ear. Mullein Q: Helps when wax, water or other discharge accumulates in the ear. 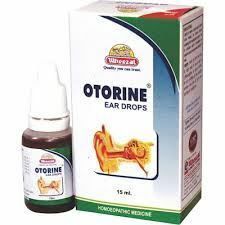 3 to 5 drops to be instilled into ear 3 times in a day.